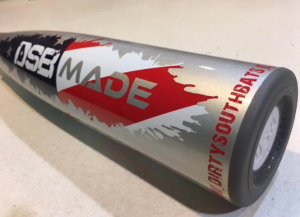 After several hours with the bat, we have a few things to point out in our 2018 Dirty South Made USA Bat review. The barrel profile on the DSB Made drop 10 is smaller than the Ghost X and Quatro, but comparable to the CF Zen. The Made’s feel at contact is at least as good as the Quatro’s, better than the Ghost X USA, but probably behind the USA Zen in terms of overall feel. The Made stands as a legit and well priced option in the 2018 USA two piece composite bat race. After exit speed testing, we think the 2018 USA Dirty South Made barrel performs as well as any other composite barreled bat you can find in the USA space for 2018. 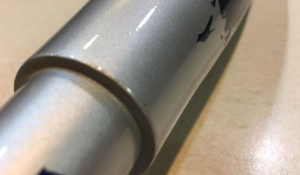 Although we are yet to be convinced two piece composite barrels are the answer for the USA Bat space, we think if you are convinced, then the true drop 10 swing weight, performance and price point of the 2018 Dirty South Made should put it on your very short list. At release, the Dirty South was available in a 30-inch drop 10 and a 31-inch drop 12. At the time of this writing (just a few weeks after its release) the bat is now available in a 28, 29 and 30-inch drop 10 and the drop 12, 31-inch. Dirty South’s intent is to offer the bat in a 31-inch drop 10 as well. The best way to see what they have available is to check their website. The DSB Made comes in a drop 10 and a drop 12. We note the drop 12 is a different bat than the drop 10 as the drop 12 is a single piece bat. Single piece bats feel much different than two piece bats. We DID NOT HIT with the drop 12. We find naming the two bats the same confusing. But, for what it is worth, Rawlings does it too with their drop 12 VELO and drop 10 VELO. Our guess, and this is just a guess, is the drop 12 lacks the power and forgiveness on mishits to be considered seriously. Never in our lives have we been impressed with a single piece full composite bat in a drop 12 regardless of company of origin (yes, including Combat). As much respect as we have for Dirty South Bats, we don’t think they somehow cracked some laws of physics. We are doubtful, but in the end, must admit that we have never swung the drop 12. If we start hearing great things about it, we will figure out a way to get it in the lab. We were the very first independent group to review the Dirty South Bats back in 2015. It has been interesting and impressive to see them grow in their presence on social media and in the eyes of individual reviews. Very recently, they worked out a chance to sell some of their USSSA bats on justbats.com. These are significant milestones in the bat space. 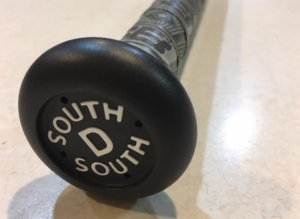 Dirty South is a USA based manufacturer of composite youth baseball bats. They also sell some peripheral baseball items like batting gloves and bat wraps. Our experience with the company has been mostly positive. Although they lack some of the major features more established brands produce (like a lot of size options, including a BBCOR line) what they do produce is legitimate stuff. We have yet to find a kid who did NOT like their Dirty South bat. Nor have we found anyone that has anything but good things to say about the brand and company. They are active in guerilla marketing via social media circles. As a generally wide industry note, we think the disappearance of Combat left a void that DSB is filling nicely. Dirty South Bats has a small, home grown company sentiment producing big barreled composite bats against behemoths in the space. Word of mouth and a good social media presence, as well as a really big barrel, have taken them a long way. It is reasonable to assume they are on the map to stay. The Made, in a drop 10, is a two piece composite bat. That is, the bat is made from two pieces of composite fused together at a midpoint. The swing weight on the bat is right in line with other light swinging drop 10 bats on the market. In theory, the major advantage of a two piece bat is to dampen sting on mishits. Younger players especially can generate more bat speed with the added confidence that their thumbs won’t get knocked off on a poorly hit ball. As well, two pieces of material allow engineers more liberty to construct bat pieces with different functions in mind. Clearly the handle serves a different purpose than the barrel, and in a two piece bat, engineers are able to accomplish that with greater ease. The drop 12 USA DSB Made is a single piece of composite. Single piece composite bats, in theory at least, are meant to produce maximum power to the ball with the added ability to construct an enormous barrel without over-weighting the bat. Dirty South Bats, like Combat before it, has made a living in massively barreled single piece composite bats. The DSB Made, however, is not big barrel like the Swag and Big Texas USSSA DSB counterparts. There are five, counting the DSB Made, two piece composite USA bats on the market as of this writing. The other four includes the Easton Ghost X, Rawlings Quatro, Mizuno Ghost and DeMarini CF Zen. As all of these are first year models, it is difficult to tell which bat the public will latch onto the most. Easton’s Ghost X, the progeny of the Mako, gets a lot of attention. It also has a very large barrel, but has a bit more hand sting than we’d like to see in a kid bat. But, the Ghost X also comes in the most sizes and drops of any bat on this list. As a general rule, we think those looking for 1) an above average feel, 2) the most reasonable price point of the two piece composite space and 3) a two piece composite bat in the USABat space, should buy the DSB Made. There should be no hesitation to trust your money with this company. Where the DSB Made beats all the other USA two piece composite bats, although not by much, is on price. We think this a major consideration. Time will tell, but we are not convinced that composite barrels will be the answer for the favorite USA bats of the public. The restriction on the standard ties the hands of engineers so severely that a more cost effective and longer lasting aluminum might be the best solution. However, in year one of the standard, there are many legit options on the market. And, without a doubt, the DSB Made in a drop 10 is one of them. I purchased this bat last year. The handle broke after 11 games and sent it back. They glued it together thinking that would hold. Well needless to say it broke before he got an at bat. They said they wouldn’t replace it they wanted to fix it again. The company is a joke and their customer service is an even bigger joke. Do yourself a favor stay away from these guys and go with a reputable company that stands behind their bats.